Omari Head (left), college pastor of Acts Church, is turning the former Fiji fraternity house near Baylor into a discipleship house for male college students to live and work on spiritual development. With Head are (starting second from left) Trevor Taylor, Patrick McCarthy, Matthew Reid, Zach Gee, Remington Stallar and Aaron Obidigbo, who will live in the house the first year. Baylor University student Trevor Taylor (left) and McLennan Community College student Remington Stallard (center) sit beside Omari Head, college pastor of Acts Church. Both students are moving into a discipleship house Head is starting this summer at the former Fiji fraternity house near Baylor’s campus. Matthew Reid walks toward the former Fiji fraternity house near Baylor University. The house is being converted into a discipleship house where six male students will live and participate in faith-based activities and spiritual development. The former Fiji fraternity house at the corner of Speight Avenue and Eighth Street is being turned into a discipleship house for male college students to live and work on their spiritual development. Patrick McCarthy (right) greets Zach Gee on the porch of the former Fiji fraternity house near Baylor University. Both will move into the building this fall when it re-opens as the Sp808 discipleship house. 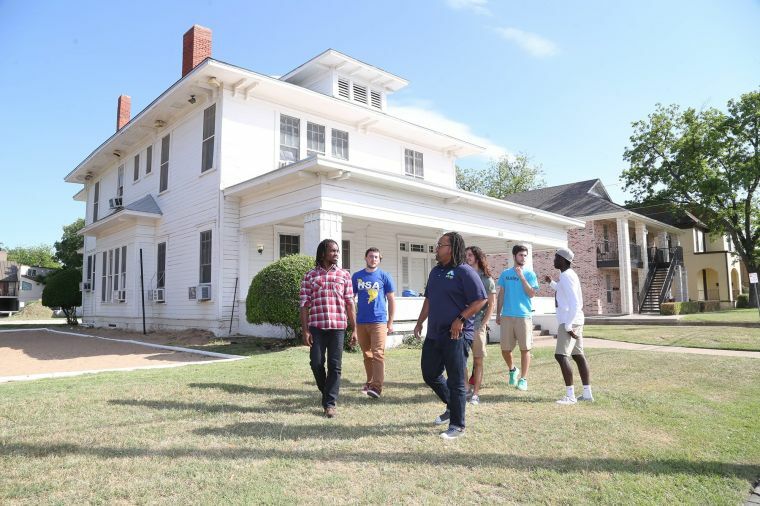 A local college pastor is transforming a former popular fraternity house on the edge of the Baylor University campus into a residence focused on helping a small group of male students live Christ-centered lives. The former Phi Gamma Delta “Fiji” fraternity house will reopen this summer as the “Sp808” discipleship house, named after the building’s address at the corner of Speight Avenue and Eighth Street. The home will be occupied by six male college students who will participate in Bible study, small group discussions and weekly talks with guest speakers. The effort is being led by Omari Head, college ministry pastor for Acts Church, who will live in the home and serve as the house director. His plan is to focus on everything from building faith and godly character to dating and developing positive friendships. faith, worship and service commitments. The concept is meant to follow Jesus Christ’s example of discipleship. The Bible chronicles how Jesus and his disciples lived, traveled and prayed together, and the group witnessed him teaching, ministering and healing others. Head said while he embraced his calling to minister to college-aged individuals, he chose to live farther away from the church and the Baylor area to separate his personal time and his ministry work. The Oklahoma City native has been Acts Church’s college pastor since 2009, and he graduated from George W. Truett Theological Seminary in 2012 with a master of divinity degree. Five students already have been selected to live in the house, and Head hopes to fill the final vacancy before the lease begins in June. The men have to pay rent to live in the home, and they are required to participate in house activities for the entire 2014-15 school year, as well as attend Acts Church. Patrick McCarthy, a freshman athletic training major at Baylor, said he learned about the discipleship house in the fall as students were beginning to make their housing plans for the upcoming school year. He hadn’t been able to find a roommate and recalled feeling discouraged that his living arrangements weren’t finalized. Remington Stallard is a sophomore at McLennan Community College, but he is planning to transfer to Baylor this fall to study business finance. He grew up in Waco, and he sees the house as a way to transition into a larger college environment while maintaining his spiritual focus. Freshman Zach Gee lives in Baylor’s Kokernot Residence Hall, and he said he thinks the Sp808 house will be a unique opportunity to grow and develop a spiritual support system while he navigates the college life. Head said he hadn’t planned to target the popular frat house for the new ministry effort. He zeroed in on the Baylor area so that the home would be closer to the men’s classes, but he discovered that most of the properties close to campus were priced above $500,000, far more than leaders of Acts Church were willing to invest in supporting his vision. During a property scouting trip last fall with church members, Head pointed out the frat house as the ideal spot for a discipleship house. One of the members immediately took him to the house’s property manager, University Rentals, which informed Head that the building was not for sale but that the lease was available for the first time since the Fiji organization originally moved into it. The fraternity was suspended last fall for violating campus policies. The discipleship house will host various community events like Christian music concerts, spoken word nights or barbecues, for example. Stallard is an indie rock singer and guitarist, and expects to perform music for guests from his recently released CD. Head said the men also will work on practical skills like cooking, cleaning, working out and living a healthy lifestyle. The residents will get some experience in home maintenance in fixing up some of the disrepair from the home being used for countless parties and fraternity events in the past 15 years. 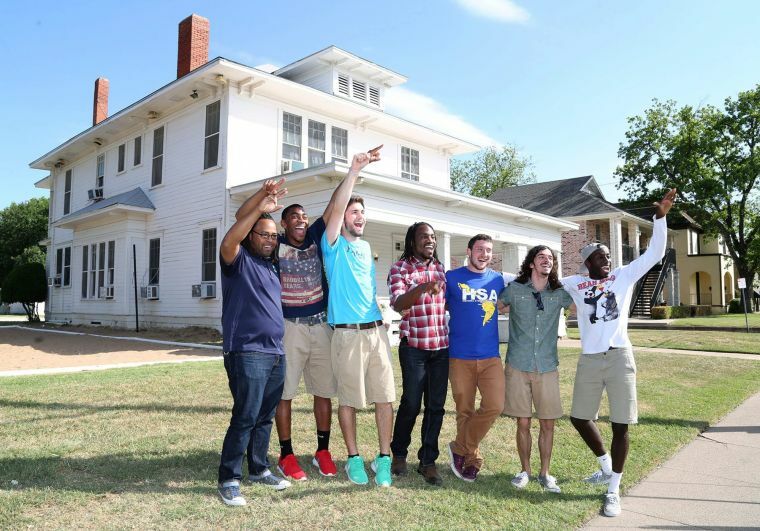 The Sp808 discipleship house will serve as a spiritual residence center for male college students focused on building faith and godly character. The facility has one more opening for the 2014-15 school year. Candidates have to be enrolled as an undergraduate at a local university and commit to the program for the entire school year, including paying monthly rent. For more information or to apply, contact Omari Head at omari@actswaco.org.